Prime Minister Narendra Modi’s four-nation European tour was an opportune time to reach out to Europe just as the Anglo-American allies are turning their back to Europe for different reasons. 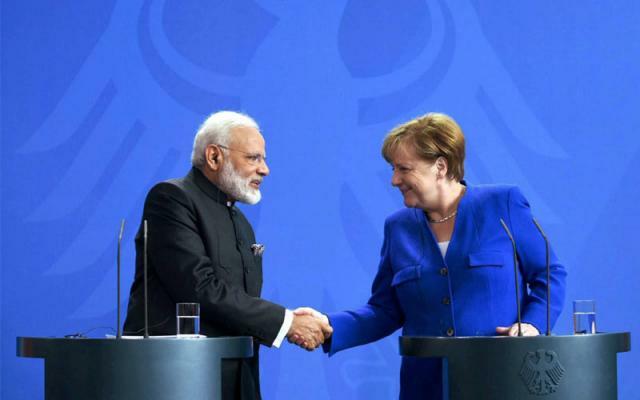 India and Germany are made for each other, said Prime Minister Narendra Modi during his first visit to Germany this year (he is due to visit Germany again later in July for the G-20 summit in Hamburg). The comment was made at a time when Germany, affected by Bexit’s impact on the European Union and the US, is rethinking its support to Nato, is taking a closer look at Asia. Rattled by US President Donald Trump’s disdain for Nato and his claims that Germany was not paying its full share of Nato expenses as well as criticising German trade policies, German Chancellor Angela Merkel has spoken of looking for closer cooperation in Asia. Germany is the strongest economy in Europe; it has close economic ties with China and is India’s largest trading partner in the EU. Modi has been a strong advocate of his Made in India scheme during his foreign arrivals. Merkel’s thrust towards the two Asian powers – China and India, would complement India’s quest for foreign direct investment. During his four-nation European tour, Modi travelled from Germany to Spain for the first visit by an Indian Prime Minister to Spain in 31 years, from Spain to Russia for the annual Inter-governmental conference and finally reaching Paris to meet the newly elected French President Macron. President Macron is likely to take a more assertive stance in world politics. He has already shown that he is a consummate political player with his meeting with the two top world leaders, Donald Trump and Russian President Vladimir Putin. He outmatched Trump with his steely handshake at the disastrous G-7 summit and had a few plain words for Putin over Russian media’s attempt to target his campaign office during the French presidential elections. Putin had backed Macron’s opponent, the right-wing Marine Le Pen, but had made a short visit to Paris to make amends with the new French president. India-EU relations had been affected by the lack of focus in India’s approach to the EU. India’s dispute with Italy over the two Italian marines under trial in India for killing two fishermen, who were mistaken for pirates, had affected the ties. India and EU trade relations had languished for many months; trade negotiations on the India-EU free trade agreement were effectively stalled while India went through the process of revisiting all trade treaties as the Modi government believed that the agreements were not in India’s interests. The EU remains a major trading partner for India and New Delhi has to strengthen its political and economic ties with the European Union in the coming months. The Italian marine issue is no longer a sensitive problem but bilateral investment protection treaties have lapsed or on the verge of lapsing with several European countries. India has to end the malaise that resulted in the stalling the free trade negotiations. European diplomats in Delhi have warned that the failure to bring in a free trade agreement could result in decrease in foreign investments from Europe. The Modi government had scrapped investment protection treaties but has not made headway on discussions to provide the protection for foreign investment. The Indian delegation has indicated in Berlin that it was ready to make efforts to conclude an FTA as the earliest. Indian planners have for long pointed to Germany’s vocational training model that is geared to German domestic industrial needs as a model that would be useful for India. Germany’s small and medium scale manufacturing can also be replicated in India. But in 1914 it chose to drop German as a third language in Kendriya Vidyalaya schools. However, the numbers of students opting for German as their international language went up by four times and students have done well in their German classes in 2017. The European Union was represented at China’s Belt and Road Forum meeting in Beijing, but it avoided signing a trade declaration with China. Germany has also expressed doubts about China’s financial terms for the Brick and Road Initiative projects. India, which has been a beneficiary of globalisation ever since it initiated economic reforms in the 1990s, requires foreign collaboration and investment for its ‘Make in India programme’. In these uncertain political times, India needs to intensify its partnership with countries in Europe and elsewhere, like Germany, France and Spain in Europe and Japan and Australia that are willing to buck the anti-globalisation trends advocated by the UK and the US. At the same time, it needs to align with countries that are not willing to become a part of Chinese Belt and Road Initiative and cede global economic primacy to China as the initiator of the BRI.